Family campgrounds are found throughout Butte Valley. Located primarily in the mountain areas that surround the valley floor, visitors can reach these sites on improved roads. The most popular are Juanita Lake, Martin’s Dairy, Shafter, Lake Orr and Medicine Lake. Juanita Lake was freshly improved in 2009 & 2010. The 55 acre lake is regularly stocked with rainbow and brown trout and has both a catfish and bass population. No motors are allowed on the lake; however its size makes it ideal for rowboats, canoes, float tubes or small sailboats. A paved path extends all around the lake, providing Handicap Access. During the Summer period, a camp host watches over the campground. There is no charge for day use and all facilities that include: barbecue grills, picnic tables, water, vault toilets and boat ramp. There are 24 campsites and a group site available to reserve. These sites are level and improved. Maximum stay is 14 days. The campground is open April thru October dependent on weather. The lake is open year round for fishing. At 5100 ft. elevation, access to the Lake can be difficult during the winter months. Directions: Approximately 17.6 miles south of the Oregon-Cal border on Hwy 97, head West on Ball Mountain Rd. Proceed W. 2.7 mi to the fork in the road go right on the paved road for 3.8 mi. to its end. Turn left and go .2 mi to the campground. For more information check with the Goosenest Ranger District located on Hwy 97 just south of Macdoel , 530-398-4391. Located on the south slope of Ball Mountain at the head waters of the Little Shasta River. Martin's Dairy Campground was a dairy and a creamery located on the Martin Ranch before 1900. This camping area offers 8 campsites with piped water and sanitary facilities. Martin's Dairy Horse Camp is about ¼ mile from Martin's Dairy and has 4 campsites and a 4-stall corral and limited horse trailer space. Recreational activities include fishing in the Little Shasta River, which is regularly stocked with trout and hiking in this quiet and scenic area. On gravel road six miles south of the town with tables, benches, stoves, piped water, sanitary facilities and trailer spaces. Shafter Campground has 10 campsites. 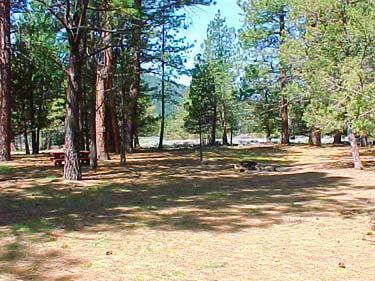 It is a tranquil campground next to lush meadows with wildflowers early in the season. 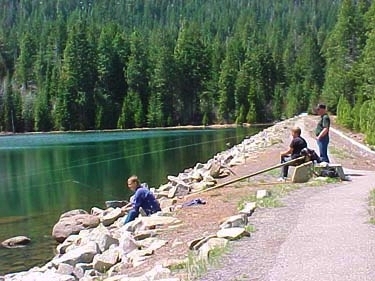 Recreational activities include fishing in Butte Creek, which is regularly stocked with rainbow and brown trout. This campground is also popular during fall hunting season. Medicine Lake, east of Macdoel in the Modoc National Forest, has 72 campsites and covers 600 acres. It is a popular and beautiful spot for boating, swimming, fishing, and camping lake near Glass Mountain. The Forest Service campgrounds on the north and south shores are reached by following roads from Dorris, Mt. Hebron, and Tennant. Medicine Lake is located in the Medicine Lake Highlands Caldera. A caldera is a crater more than a mile across. This caldera is 4 ½ miles wide and 6 ½ miles long. The lake is over 120 feet deep in areas and is at an elevation of some 6700 feet. During the summer months a Ranger station is open on the west end of the lake. During the winter, the lake is a popular snowmobiling destination. Power boats are welcome on the lake. Just remember at this elevation your motor will likely lose some of its power. Now a Forest Service campground, this lake is between Highway 97 and Tennant. Boating (no motors over 12 hp), swimming, picnicking, camping, and fishing are allowed. Check with Goosenest Ranger Station for facilities status at: 530-398-4391. The Lake has limited cattail vegetation but abundant water lilies, open marsh, ponderosa pine, riparian willows and aspen. Mt. Shasta (14,162 ft) provides an exquisite background for the lake. Shovel Creek is an excellent example of “Dispersed Camping” opportunities throughout Butte Valley. Steep canyon walls, rugged terrain and a small stream filled with Brown and Rainbow trout just waiting for a tiny morsel to float by is the best way of describing Shovel Creek. Just off the gravel road, you will find several unimproved campsites available for the taking. If you find campgrounds too confining, dispersed area camping might suit your taste. Some favorite camping areas are located along Butte and Antelope Creeks. Generally, you may camp anywhere within the National Forest unless it is otherwise posted. However, checking with the Goose Nest Ranger station is advisable. A lot of private lands border the national Forest and require permission before you camp. Additionally, campfire permits are required for all dispersed camping.